The easiest way to do a cable replacements for three audio/video channels using the 5.8GHz frequency. For you! The Wireless Multi-Bridge system consist of the transmitter and the receiver . 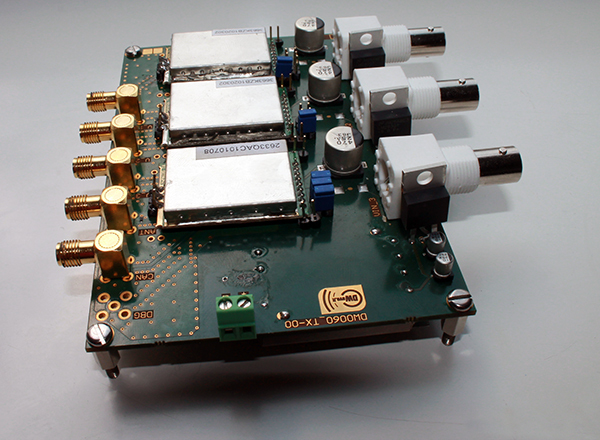 It supports up to three analog video and audio channels through the 5.8GHz ISM band and one 2.4GHz ISM channel using a single RF interface. This feature helps the user to reduce the total amount of antennas, RF power amplifiers, RF filters and power sources required by the whole wireless system. It also reduces the required room for the wireless end-points. The three 5.8GHz ISM channels can be set using the on board jumpers in order to avoid interferences with other wireless equipments. Video S/N Ratio (100KHz, 1VP-P Sine Wave) 40dB, min.